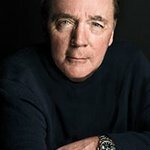 Sixty-five-year-old crime and thriller author James Patterson has sold more novels than Stephen King, John Grisham and Dan Brown combined by creating unforgettable characters like psychologist Alex Cross, NYPD detective Michael Bennett and homicide inspector Lindsey Boxer. Now, Patterson is teaming up with the National Kidney Foundation and global charity auction site Charitybuzz.com to auction the chance for one lucky bidder to have a character named after them, or someone they choose, in an upcoming book. Villain, hero or victim – the choice is Patterson’s, and the winner will have to read the book to find out! Bidding is open today through Monday, February 11th, at charitybuzz.com/catalog_items/334730. Closing just in time for Valentine’s Day, this Patterson-fan-dream-gift is valued at $15,000. Bidding is currently at $6,010. Patterson has written 107 books, sold more than 275 million copies and boasts 83 bestsellers, a Guinness World Record. Proceeds of the auction benefit the National Kidney Foundation, the leading health organization dedicated to fighting kidney disease. Currently, 73 million people in the United States are at risk for developing Chronic Kidney Disease, the 9th leading cause of death in the U.S. NKF is dedicated to the awareness, prevention and treatment of kidney disease for hundreds of thousands of healthcare professionals, millions of patients and tens of millions of Americans at risk.